This is when you jump the skateboard onto an obstacle and slide along it. It is super fun and often makes a great sounds. 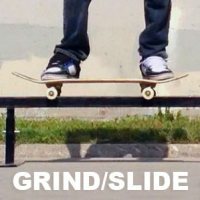 A grind is when you slide on the metal trucks of the skateboard. A slide is when you slide on the deck of the skateboard. They both slide but the trucks will make a grinding noise. It feels really good to grind something rough. There are many combinations of each. These are the major ones to learn here. Like any tricks there are more but don't worry about learning them just yet. Stick with the 50-50 and the boardsilde at first. Learning these two well, will lay a good foundation for trying the rest. These tricks can be done on a ledge or a rail. Ledges are and curbs are much easier to learn on. I really enjoy skating rails but they are more tricky. Plus you run the risk of sacking yourself. Yes, this does happen and it is not fun. Each of these tricks can be done frontside and backside. I have put the easiest one up first. The fs version and the bs versions are very different. In some case one is really easy and the other is really hard. These tricks get very detailed. Don't worry. Just learn one at a time. There are some things that you can slide or grind on and somethings that you can't. So how do you know what is what? Is there a way to make things slide easier? There sure is. Basically any edge in a skatepark with slide. They are lined with metal so that they are hard enought to slide good. In the streets metal and painted concrete will slide good. You can use wax as lubrication to skateboard. Wax in smooth concrete will slide good sometimes. Many skaters like sliding on hard rock like granite. Often mis-named marble. In the streets granite gives a good feeling grind. Skateboarding and waxing things you find in the street will mark it up. It leaves a blackish, gloppy, streaky mess behind. I think it looks great. It's people using the urban world we live in for fun. Not everyone is a fan. Be respectful of where you skate and wax.